Sadly for me the chapter on childrens wear was not included, but somewhere in the back of my mind I remembered seeing a link on a blog somewhere at some point in the past in which the author had found the Vintage Sewing Info site using a search engine which finds pages as they appeared at some point in the past. (It's called Wayback but that didn't pop back into the memory, as I had never heard of it previously). A minute or two with google popped up Magdamagda Design Studio and her post on the subject. And here is the whole book. Et Voila - I had all the information again! I am incredibly grateful to all the people who have pointed to these resources, which are fantastic. I love the internet. And because I prefer posts with photos I'll end with this extremely blurry shot of Nicholas. He had gone into the kitchen and was suspiciously quiet. 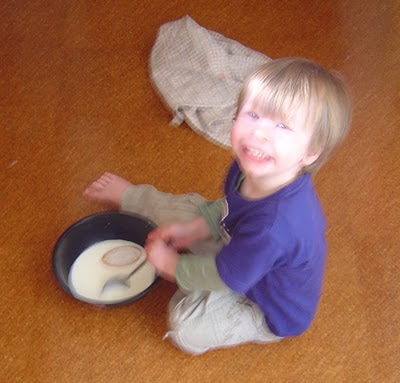 Upon investigation I found this - he had got the bowl from the cupboard, milk from the fridge, poured it and put the bottle back (lid on and everything) and got a couple of biscuits which he was happily stirring with a spoon. Apparently he was making a pikelet sandwich. Thank you for taking the time to find these and post about it. I too was dismayed when the original links went down and was contemplating paying the $55+ price tag for a reprint copy. That looks to be a very useful website, it may well come in handy! Thank you, thank you. Yes the internet is awesome.